A dog bit me on Memorial Day. That led to stitches which led to an infection which led to an allergic reaction to the antibiotic I was on for the infection. And so it went for about three weeks. None of this was life changing. It was more than inconvenient, but definitely less than a crisis. In a world where 842 million people go hungry, this barely registers. Still, an infected dog bite was not what I needed in the midst of a very busy season of work and family events. In a small way, this episode is an example of what Scott Peck famously wrote on the first page of his book A Road Less Traveled: “Life is difficult.” Yep. Which leads me to a word and movement that I find intriguing these days. The word is “resilience” and I find it everywhere. There are resiliency trainings for educators, fire fighters, physicians and parents. There are events to help your children become more resilient. There are academic programs and papers, workshops and retreats. Seems everyone is in to resilience these days. Google it and see what you get. 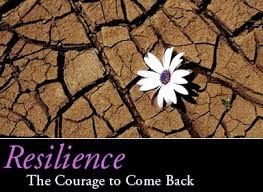 The dictionary defines resilience as “the ability to recoil or spring back into shape after bending, stretching, or being compressed.” I suspect this is why resiliency programs are so popular these days—so many of us feel that we are bent, stretched or compressed in one way or another. If it isn’t a dog bite, it is the lack of time, or financial worries, or relationship strife. Life is difficult—it stretches all of us. To be spiritually well doesn’t mean these challenges pass us by. Spiritual wellness is about resilience, being able to come back from difficulties. Many of the world’s religions have offered early versions of resiliency training. Christianity is the one I know best, and it has at its core the idea of springing back after being bent, stretched and compressed. The Apostle Paul gives one of the all-time great resiliency quotes when he says “We are hard pressed on every side, but not crushed; perplexed, but not in despair; 9 persecuted, but not abandoned; struck down, but not destroyed.” (2 Corinthians4:8) I am pretty sure he is referring to more than a dog bite there. There are a lot of reasons I am an imperfect practitioner of a faith tradition (with emphasis on the “practice” part of that word.) I treasure community and I like to sing, to name just a few. But I also participate because life is difficult, and I need all the resiliency I can find. I find it in faith community.